U.S. generals and battlefield commanders, military analysts, journalists, and a commanding general of the Iraqi Republican Guard. 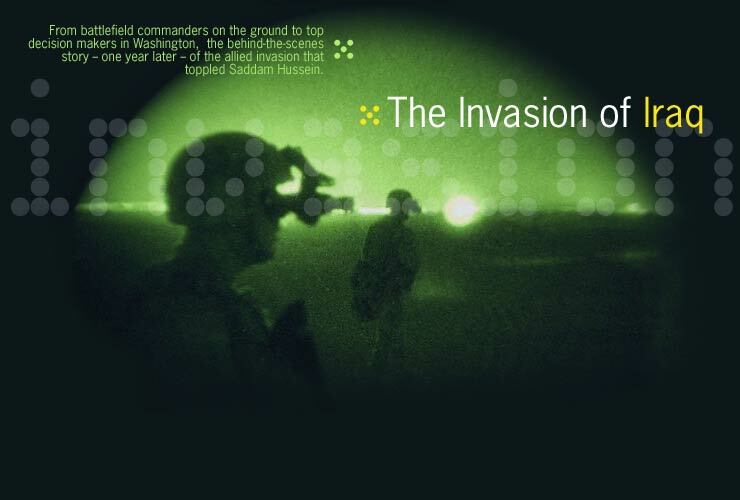 An account of the strategies, key battles, surprises, and turning points of Operation Iraqi Freedom, drawn from the documentary. What lessons have been learned from the war? What questions remain? How successful were allied forces in avoiding civilian casualties? FRONTLINE marks the first anniversary of the Iraqi War with a two-hour documentary investigation that recounts the key strategies, battles, and turning points of the war from both sides of the battlefield. Through firsthand accounts from many of the war's key participants--from strategists in Washington to the soldiers who actually fought the battles--"The Invasion of Iraq" promises to be a definitive television history of America's most recent war.